The Lake Superior coastline between Whitefish Point and Grand Island stands as one of the most beautiful stretches of shoreline in all of the Midwest. With pleasure boaters, tour boats and kayakers making their leisurely way along the coast to soak up the natural beauty. It is difficult to imagine that during the 1800's this stretch of seemingly bucolic coastline was known to mariners as "The Shipwreck Coast," with the hulks of innumerable vessels pushed onto the shore by violent storms out of the north, or lost in the pea soup fogs which frequently enveloped the area. Since the early 1850's, the Lighthouse Board had been working on establishing a series of Lights to guide mariners along this treacherous stretch, with Lights established at Whitefish Point in 1848, Grand Island in 1867, Big Sable Point in 1874 and Grand Marais in 1895. 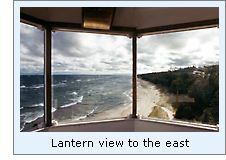 As further witness to the dangers represented by this stretch of coastline, Congress approved the establishment of four life saving stations between Vermilion and Deer Park on June 20, 1874, one of which was designated as Station Ten, and built at an unnamed point approximately fifteen miles west of Whitefish Point. Although David Grummond was appointed as the first keeper at life saving station 10, it would be Christopher Crisp who served as keeper from 1878 until 1890 who would have the most lasting impact on the area, as Crisp became so well known that the point on which the station was established would become forever known as "Crisp's Point." After several wrecks occurred off the point, the Lighthouse Board observed that "this is a dangerous point for vessels bound down the lake in thick weather. These vessels all try to make Whitefish Point, but a slight variation in their course from the nearest point of departure will run them ashore near Crisps Point." Estimating that an appropriate lighthouse and fog signal could be built for $18,000, the Board made its initial request for an appropriation for establishing a new light station at Crisp's Point in its 1896 annual report. Congress evidently disagreed with the need for the new station, as it failed to appropriate the requested funds. However, convinced of the need for the station, the Board reiterated its plea in each of its annual reports for the following six years until Congress finally came through with the requested appropriation on June 28, 1902. Under the direction of Eleventh District Engineer Major Lansing H. Beach, a fifteen-acre site for the new Light was selected in August 1902, plans for the structures and iron work were drawn up, and contracts awarded for furnishing the building materials and iron work for the tower and fog signal plants. Title for the reservation was obtained on May 21, 1903, and work began soon thereafter with the erection of a timber wharf to facilitate the delivery of materials. 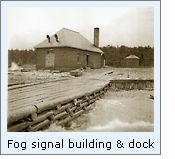 By September, the exterior brick work of the tower, dwelling and 22' x 42' fog signal building were complete, and a wood frame boat house and ways had been erected. After a brief interruption to recover from a violent storm which obliterated the wharf and boat ways on September 23, work continued with the installation of the first fog signal plant, the erection of a barn for the keeper's horses, completion of the dwelling interior. The District Lampist arrived at the station and carefully hoisted the lens components into the lantern for assembly atop the cast iron pedestal which had been installed to receive it. Designed and built by Sautter & Lemonnier of Paris, the fixed red Fourth Order lens was located at a focal plane of 62 feet, affording the Light with a distance of visibility of 15 miles at sea. While work was virtually complete, winter's icy grasp forced abandonment of the site on December 18, and the station stood empty to await completion on the opening of the 1904 navigation season. Keeper John E Smith, First Assistant William J Gramer and Second Assistant Charles H Basel were appointed to man the new station, with Smith and Gramer arriving at the station on March 3, and moving their belongings into the new dwelling. Basel reported for duty on April 27, and the three men set about cleaning up and readying the station for the return of the working party. Smith and his crew exhibited the station's Fourth Order lens for the first time on May 5, and the lighthouse tender AMARANTH returned with the work party and the steam plant and whistle later that month. Over the following month, installation of the boiler and a 10-inch locomotive whistle was completed and the system tested to ensure that it provided the station's predetermined characteristic repeated 60-second cycle consisting of a ten second blast followed by 50 seconds of silence. Finishing touches were put on the buildings, and with construction complete on June 10, 1904, the AMARANTH returned to transport the working party to their next assignment. A work crew returned in 1905 and installed a second boiler with an improved 10-inch chime whistle in the fog signal building. The locomotive whistle on the original boiler was removed and also upgraded with a similar chime whistle. The crew also erected a brick service room at the entrance to the tower to provide the keepers with a working area for lamp cleaning and lens maintenance. 1906 saw the installation of 750 feet of concrete walks connecting the station buildings and a new 132 foot long stone-filled timber landing crib was erected in 1907. 1907 was also likely a memorable year for Crisp Point's keepers, as they labored to shovel 24 tons of coal into the hungry boilers to keep the whistles screaming a station-record 383 hours. 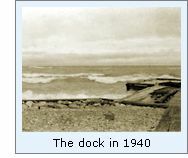 1907 was also the year in which government reports on the station began using the name Crisp Point, as opposed the Crisp's Point, as had been the case previously. The characteristic of the light changed was changed from fixed red to fixed white on April 12, 1924, and the illuminating apparatus changed to an incandescent oil vapor system with a resulting increase in output from 780 candlepower to 2,900 candlepower. Wave action across the beach in front of the station was a constant problem, and a number of timber piers were erected along the shore in an attempt to minimize the problem. The chime whistles were removed from the fog signal in 1933, and replaced with an electric powered air siren, which received compressed air provided by a diesel engine-powered compressor. With the Coast Guard's assumption for responsibility for the nation's aids to navigation in 1939, a program of cost reduction and automation was instituted. To this end, a generator and battery equipment was ordered in 1940 to allow the electrification of the Crisp Point and the elimination of the need for full-time resident keepers at the station. 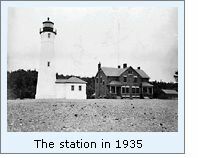 This electrification and automation was completed in 1941, and the station boarded-up and left to the elements with the exception of infrequent inspection by crews from Coast Guard station Whitefish Point. With improvements in radio technology and radar, the decision was made to deactivate the station in 1947. Unmanned and exposed to the elements and vandalism, the structures began to deteriorate rapidly. Considering them an "attractive nuisance," the Coast Guard demolished all of the station structures with the exception of the tower and attached service room in 1965. The station was officially decommissioned in 1994, and without keepers maintaining the protective piers, shoreline erosion had progressed to the point that the lake was lapping at the very base of the tower itself. After the brick service room collapsed in November 1996, the GSA feared that the tower itself was in danger of toppling, and not wishing the responsibility and cost of stabilizing or demolishing the tower, the property was scheduled for auction in 1997. Ohio visitors Don and Nellie Ross came across the old station, and taken with the natural beauty and history of the location, partnered with a number of area residents to form the Crisp Point Lighthouse Preservation Society, with their charter being the restoration and long term survival of what was left of the station. Stone reinforcement was trucked-in to the site in 1998 and laid around the tower foundation, and numerous trees have been planted to stem erosion of the dunes. The tower was cleaned and painted in 1999, and wooden walkways have been built, also to stem erosion atop the dune on which the tower sits. Click here to see a complete listing of all Crisp Point Light keepers compiled by Phyllis L. Tag of Great Lakes Lighthouse Research. Crisp Point will forever be remembered as a gem at the end of one of the most grueling drives we have ever undertaken. The first fifteen miles of the drive are on numbered County roads which are little more than groomed sand trails. The last five miles are on what appears to be nothing more than a logging trail. As you progress, the trail gets progressively narrower and increasingly twisty, as the trail has to circumvent every tree that has grown in the path. We felt really fortunate that we never encountered a vehicle coming in the opposite direction, because we never remembered any place where there was sufficient room to pass! The road ended at the beach, with a half mile walk put us at the light. This one of the most magnificently desolate locations we have visited, and other than Sue’s frequently glancing the edge of the woods for any sign of bears, remains in our minds as one of our top ten favorite lights. We returned to "The Point" on a windy and cool September 15, 2000, and met with Don Ross of the C.P.L.P.S. We had arranged to meet with Don some time before, and he opened the tower and we climbed to the lantern room. The view of the lake was fantastic, and watching the waves rolling into the shore was almost mesmerizing. While it was chilly outside, the solar gain in the tower warmed things up nicely, as we stood around and spent a pleasant half hour chatting with Don about the work that has been done at The Point since our last visit. We can provide no better directions on how to get to Crisp Point than those provided by the Crisp Point Lighthouse Society on their website. Click on the link to their site above, and then select the "Driving Directions" link. They have both a map and descriptive text with odometer readings. We wholeheartedly recommend that you print their directions and take them along with you. You will not regret it! 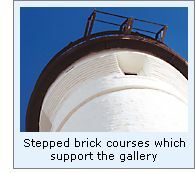 Click here to visit The Crisp Point Light Historical Society website.